We strive to involve as many athletes as possible in a positive athletic environment while instilling in all athletes an exemplary work ethic and the qualities of accountability, citizenship, and a high degree of sportsmanship. Practice ends at 5:00. Both boys and girls can be picked up at the front of the athletic building no later than 5:15. Athletes must make up any missed practices prior to running in the week’s meet. Athletes who are scheduled to participate in an event but miss a meet for a nonschool related activity must sit out the following meet as well. Coaches must know by the Monday before meet day if an athlete will miss a meet. Athletes will try-out to participate in the events of their choice. Athletes with the fastest times or farthest/highest jumps/throws will be selected to participate in that week’s meet. Athletes may try-out again the following week for the events of their choice. A tentative schedule will be given to athletes. The times are approximate as meets may run ahead of schedule or behind schedule. Parents are welcome to bring a meal/snack to their child at the stadium. We will not eat as a group at Dowell. Athletes should always drink plenty of water and eat healthy when in training. Dowell will provide uniforms and sweats to meet participants. Sprinters, hurdlers and jumpers may wish to purchase spikes. We will take a bus to the meets. 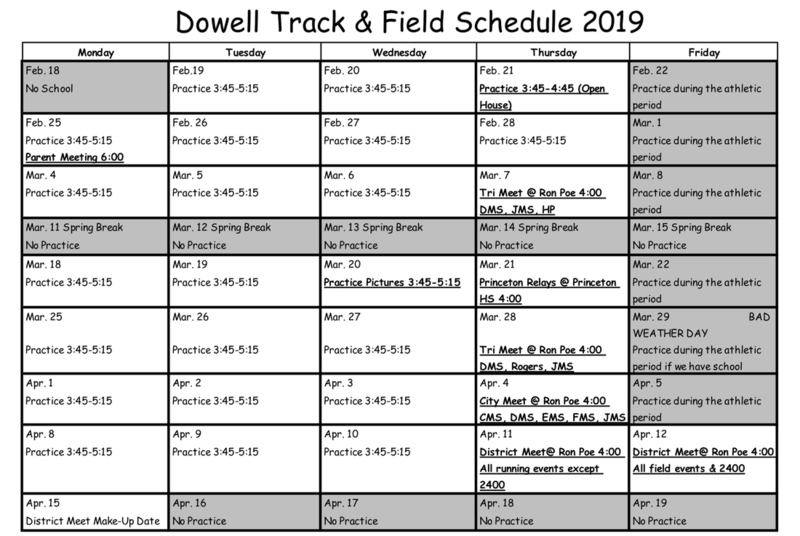 For the Princeton meet, we will have a return bus back to Dowell. For meets within McKinney, parents must pick up their athlete from Ron Poe stadium. Athletes must be signed out prior to leaving the stadium.